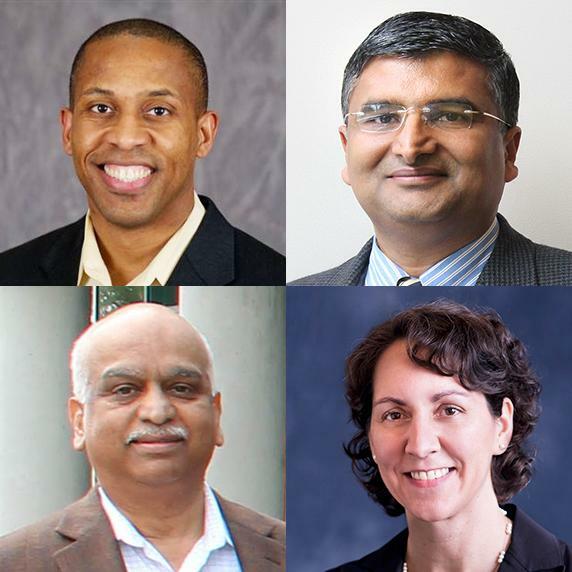 Pictured clockwise from top left: Edward Botchwey, Ph.D., Jaydev Desai, Ph.D, Machelle Pardue, Ph.D., Sathya Gourisankar, Ph.D.
Edward Botchwey, associate professor in the Wallace H. Coulter Department of Biomedical Engineering at Georgia Tech and Emory, for outstanding contributions to immunoregulatory biomaterials and national leadership in biomedical engineering. Jaydev Desai, professor and BME Distinguished Faculty Fellow in the Wallace H. Coulter Department of Biomedical Engineering at Georgia Tech and Emory, for outstanding contributions to medical robotics at the micro, meso, and macro-scale. Sathya Gourisankar, professor of the practice and director of the Biomedical Innovation and Development Program in the Wallace H. Coulter Department of Biomedical Engineering at Georgia Tech and Emory, for outstanding contribution in medical device product development and transformative leadership in developing a professional master degree program in medical devices. Machelle Pardue, professor in the Wallace H. Coulter Department of Biomedical Engineering at Georgia Tech and Emory, for outstanding contributions to understanding and treating blinding diseases, and for extraordinary service to the field. A formal induction ceremony will be held during AIMBE’s 2017th annual meeting at the National Academy of Sciences Great Hall in Washington, DC on March 20, 2017. Botchwey, Desai, Gourisankar, and Pardue will be inducted along with new colleagues who make up the AIMBE College of Fellows Class of 2017. For more information about the AIMBE annual meeting, please visit www.aimbe.org.